Six Months – Tamara Shazam! Bradley and I ran 3.4 miles today like it ain’t no thang. 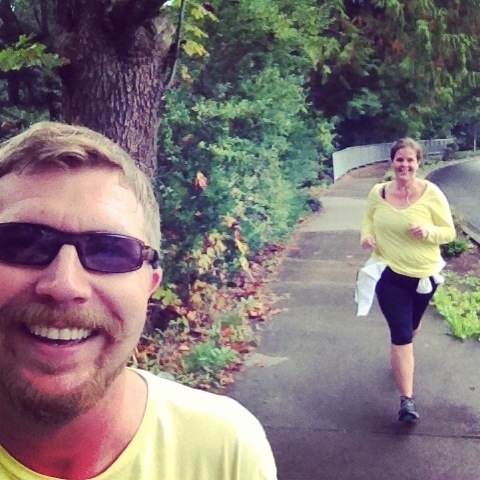 On this run I told Bradley that it was only a little over six months ago that I started running. He stared at me like I’m crazy for a second and tried to argue that we started a year ago. But it was a year ago that we started walking the neighborhood every day. I was on ‘The Slowest Diet in the World’ which entailed just making sure the scale didnt go up. I would, generally, lose 1-10 pounds every 4-6 months. It was working, s-l-o-w-l-y. Then in January I decided to step it up a little. Control my food more. Add some weights or something. But nothing really changed. Then on January 28th I just got SICK of it. I can’t even remember the trigger anymore- but I think it had something to do with an inspiring story from Runs for Cookies Katie and I thought if she can, why can’t I? So I committed. I learned about determination, will power and on March 5th, 2013, I took that first wobbly block by way of jogging during an especially inspiring moment with Katy Perry’s song: Firework. From there it’s been 215 miles, about 40 pounds and 47.5 hours of running my roads. It’s been one of the best times and experiences of my life and I’ve never felt more proud or complete. One of my major goals last spring wasn’t just to ‘diet’, but it was to makeover our family diet. This meant realigning our taste buds with whole grain goodness and vegetable-lisciousness. I’m proud to say that we have, thus far, been successful! Today we were out at ye olde mom and day’s ranch (they are in town from Idaho for a week) celebrating my nephew’s 11th birthday. They had steak, we had veggie tube steak and when I looked down at my plate, it was covered with vegetables! We had green beans, Brussels sprouts and salad to go along with our respective ‘steaks’! I was reflecting on my way home and realized how much things have changed in our house. Gigi asked for whole grain hot dog buns today. Jude will eat vegetables now (and prefers brussel sprouts). We eat more fruit than pasta now. I eat dried fruit and nuts instead of chocolate when I want a sweet snack. We eat serving sizes. We buy brown rice now. Vegetables and fruit rarely go bad anymore while our bread often goes moldy. We integrate cauliflower and grated zucchini into everything we eat to add fiber and low-cal filler and no one complains! We are eating totally different from a year ago. That is pretty cool! I’ve lost 4 pounds since I’ve gone back to work. 4 pounds!! !